For a brief moment, it seemed like Toronto invaded Victoria. Lucky Bar may as well have been Massey Hall, as everyone who appeared onstage this evening was from Canada's music mecca and its surrounding area. Geographically linked or not, there was clearly a lot of synergy going on in this folk-heavy bill, as Jennifer Castle and the Weather Station (aka Tamara Lindeman) released a collaborative single called "Midas Touch" earlier that day. Following a solo set by former Attack in Black bassist Ian Daniel Kehoe, Jennifer Castle hit the stage with just an electric guitar and harmonica, and she didn't need anything else. She left no wonder as to why she had sold out of the vinyl for her fifth album, Angels of Death, the followup to her Polaris Music Prize-shortlisted Pink City. Her voice cut through the night, her heavenly vibrato evoking all the power of Joan Baez, Angel Olsen and Anne Murray. Castle opened her set with "Tomorrow's Mourning," also the first track on Angels of Death, but it seemed extra perfect for the line "can I band-aid this gash / with coffee and hash," given that Canada had just legalized cannabis the day before. She went on to rock stripped-down renditions of the majority of her recent album, along with a tasteful cover of "Walkin' Down the Line" by Bob Dylan. Castle didn't crack a lot of jokes, but she seemed to be in a pretty good mood for someone mostly singing about death. Performing with a full band, consisting of guitarist/keyboardist Will Kidman (Constantines), bassist Ben Whiteley (Basia Bulat, Lindi Ortega), and the aforementioned Ian Daniel Kehoe on drums, Tamara Lindeman's Weather Station cranked the rock up a few notches. 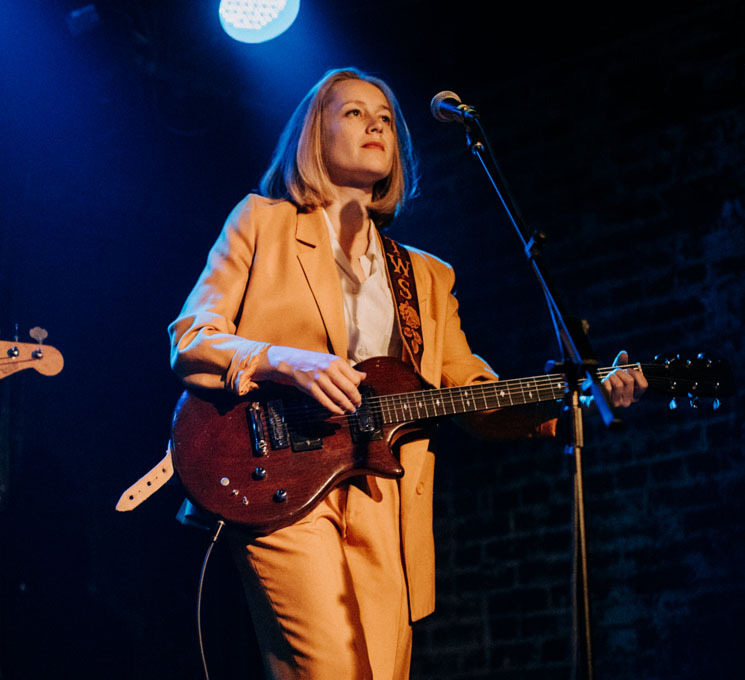 Wearing an orangey-tan pleated suit with a white button-up shirt, complementing her blonde bob and brown guitar with custom leather strap that has flowers framing a monogrammed TWS, Lindeman looked the part of an alternative country goddess, someone who could blend into the Sadies if she wasn't such a magnetic presence. It's almost hard to believe that this was her first time headlining a tour out west, but if her reception in Victoria was any indication, it won't be her last. The Weather Station delivered a dynamic set with a well-curated set list. Tracks like "Kept It All to Myself" and "Impossible" from her 2017 self-titled album pushed up the tempos and got pulses racing, but then Lindeman's band left her alone to sing a couple songs solo. The soul-searching torment of "I Mined," from her 2015 album Loyalty, was expressed almost as much through her face as her silky yet emotion-drenched voice, a voice as pure as the driven snow, reminiscent of Laura Marling or maybe Jewel if she had stayed true to her roots. Midway through their set, Lindeman put down her guitar while Jennifer Castle came out to sing "Midas Touch" from the split single they'd literally just released. Lindeman said hearing Castle play every night was a dream come true, like touring with Bob Dylan himself. To reinforce the comparison, Castle stuck around to lend harmonica to a rendition of "Nobody," from Weather Station's 2011 album All of It Was Mine, although, unfortunately, the song was haunted by a ghost in the speakers. After Castle left, Weather Station played another song that was released that day, a rather devastating ballad about how fucked up the world is, as Lindeman attempts to wear the world like a jacket and understand how it got to be the way it is. Later on, "Way It Is, Way It Could Be" and "Power" provided more examples of the band's sweeping dynamic range, yet for all of their prowess, it was delivered without a hint of ego. Whenever Lindeman wasn't playing, she graciously ducked out of the way to give more attention to those who were. For their encore, she let Will Kidman take lead vocals on their cover of "Love Radiates Around" by the Roches. A little humility goes a long way.